The good news about shoe trends is that there are plenty of party shoes you can actually stand in! The beautiful summer weather makes way for more parties and events. Many of which require standing outdoors. Sometimes even in the grass. Outdoor events no longer have to be a fashion disaster. There are plenty of gorgeous flats, block heels, wedges and slides that will get you through any summer event in style. These are some great options for the final days of summer. A low narrow wedge is a modern take on the classic style. The anthracite lamé color is just the right hue for an effortless evening look. One of the standout kitten heels with jewels done right. The ankle strap adds a little extra support for standing at cocktail hour. 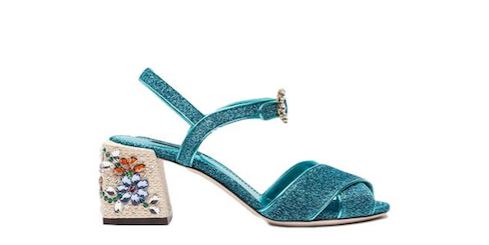 Rene Caovilla is known for fabulous party shoes and the Zabella t-sandal is no exception. 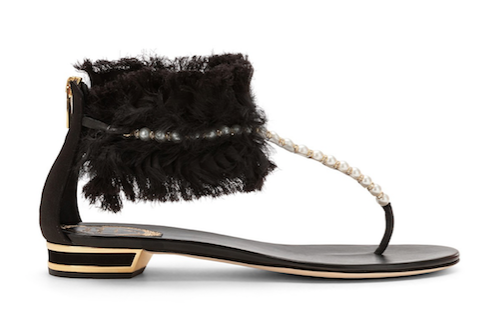 The brilliant combination of satin, fringe and pearls make this flat on par with any stiletto. The unique color and floral embellishment make this shoe special. It is feminine glitz at its best. 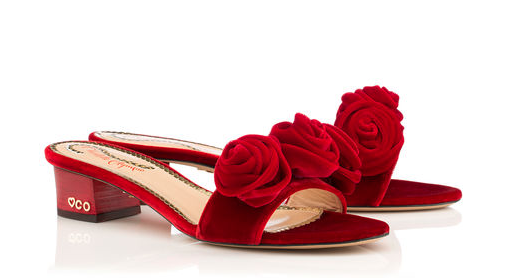 Crushed red velvet roses bring a sweet edge to this wearable slide. There is something irresistible about a lady in red.